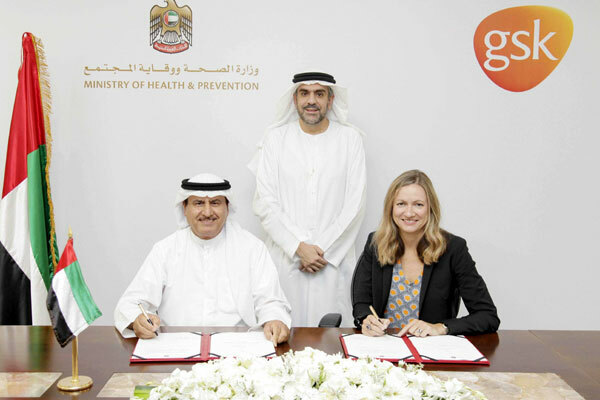 The UAE Ministry of Health and Prevention (Mohap) has signed a strategic agreement with GlaxoSmithKline Export Limited (GSK) for the provision and distribution of medical and pharmaceutical stocks in emergency situations. The list of medicines covered under the agreement includes several products for the treatment of respiratory diseases, nervous system diseases, infections, urology diseases, genecology and obstetrics, immune system disorders, and other chronic diseases. The agreement falls in line with the efforts to strengthen the UAE’s medical health security, according to the Article (4) of Cabinet Decision No. 39 of 2015, said Dr Mohammed Salim Al Olama, the undersecretary of the Ministry after signing the deal with Dr Abdul Karim Abdullah Al Zarouni, the director of emergency, Crisis and Disaster Operations Center at the Ministry; and Sally Storey, the VP and general manager at GSK. The Ministry will facilitate the movement of medicines covered under the agreement from storage places to be delivered to the concerned destinations in case of emergency, as agreed upon by the stakeholders and other medical departments, in accordance with the UAE’s federal laws and regulations, he stated. Dr Al Zarouni said that the signing of the agreement falls within the framework of enhancing health and medical security; the adoption of innovative policies to promote proactive plans and rapid response to deal with emergencies, through ensuring the supply of medical stock, which covers the needs for one year, and includes ready-to-use medicines for six months. A cooperative committee is also formed to follow up on coordination between the parties as part of the agreement and to carry out visits to the companies, he added. GSK said it will keep a stock of emergency medical supplies ready in its warehouses in accordance with the storage conditions stipulated by the rules and standards to ensure their safety and ease of use when required, in addition to maintaining an electronic link with the Crisis and Disaster Operations Center at the Ministry. In addition, the pharma giant will appoint an employee to act as the point-of-contact for the ministry. The company will also oversee the transfer and supply of required items to the strategic medical stock warehouse of the ministry or any other designated entity, it added. Storey said the partnership with the UAE Ministry of Health and Prevention is aimed at ensuring that patients in the UAE have access to the most effective, high quality medicines when needed. "Access to medicines, even in challenging circumstances, whether locally, regionally or globally, remains a huge part of our agenda and I strongly believe that initiatives such as these play a vital and much needed role," stated Storey.